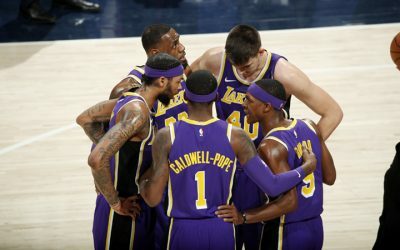 As he prepares for his first season as coach of the WNBA’s Los Angeles Sparks, Derek Fisher is also remaining active in his other role, as an NBA analyst and commentator. 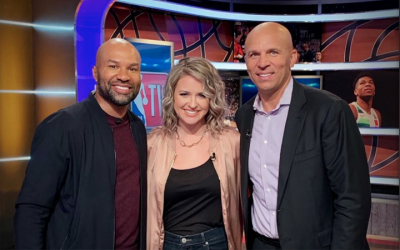 This week, that role took Derek to NBA TV’s Atlanta studios, where he joined host Kristen Ledlow and fellow former point guard and NBA coach, Jason Kidd, for Gametime on NBA TV Monday night. The trio previewed the night’s matchup between the Milwaukee Bucks and Brooklyn Nets, two teams Kidd used to coach, with a particular emphasis on the evolution of Bucks’ star Giannis Antetokounmpo. Under Kidd in Milwaukee, Antetokounmpo went from a raw talent playing the forward position, to a ball-handler, playmaker and scorer from the point. Antetokounmpo continued growth this year with Bucks, who sit atop the Eastern Conference, has put the Greek star in the thick of the conversation for league Most Valuable Player. The Bucks did go on to win Monday night’s game, with Antetokounmpo posting a near triple double of 30 points, 15 rebounds and nine assists in the 113-94 victory in Brooklyn. Later in the show, the topic of discussion amongst Fish, Kidd and Ledlow was the Dallas Mavericks. Playing a little give and go, Ledlow lobbed some questions to the two-point guards about the Mavs, a team both Fisher and Kidd played on. Dallas, of course, just traded for Kristaps Porzingis, who Fish coached in New York, making him an expert on the subject. He was asked if Porzingis, who is coming off an ACL tear, will return to All-Star form.